Inspired by Kenny Kirkland, Wynton Marsalis, Jeff “Tain” Watts and Kenny Garrett among others, the Camilla George Quartet creates a fusion of African, Caribbean, and American influences with a modern edge and pays homage to the jazz tradition. Case in point, the tune Mama Wata, a driving blues that celebrates the West African spirit and the ancient mythology of West Africa. 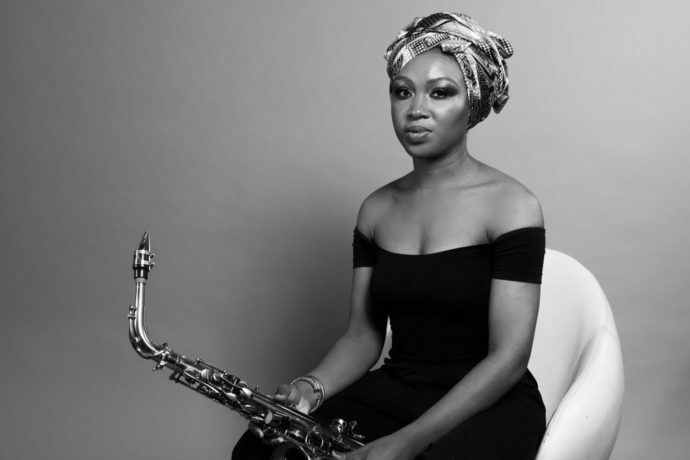 Other tunes include Song for Reds, an evocative blues dedicated to her jazz-loving late father; the breezy Calypso, Lunacity is sprinkled with quotes from (the tunes) Don’t Stop the Carnival and Salt Peanuts, and there’s a fine guest appearance from vocalist Zara McFarlane, who melodiously scats through Kenny Garrett’s Ms. Baja. T.
The Quartet’s sound is airy, joyous and when the situation demands, the groove is infectious. The players, which include Sarah Tandy, one of the U.K’s leading young jazz pianists, the dynamic duo of Daniel Casimir and Femi Koleoso and guest vocalist Zara McFarlan, exceed expectations. Camilla George has yet to capture the undivided attention of U.S. audiences but she is well on her way.